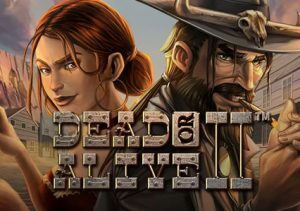 Play wild west sheriff, bring a band of bandits to justice and hopefully bag a massive bounty in the process in Dead or Alive II, the much-anticipated video slot from NetEnt. The highlight of this 5 reel, 9 payline game are the 3 free spin rounds which comes with sticky wild and multiplier extras. Play on your PC, tablet or mobile from between 9p and £9 per spin. As usual for a NetEnt video slot, plenty of effort has been put into the design of Dead or Alive II. A classic western town forms the backdrop to the reels which are set within wooden gallows. Joining the lower paying A to 10 royals are bottles of bourbon, cowboy boots, a Stetson and a pistol. The sheriff’s badge is the most lucrative standard symbol, awarding 111.11 times your bet if you land 5 across a payline. There are 5 wilds in Dead or Alive II – each of them represented by an outlaw and each appearing on their own reel. Apache appears on reel 1 with Della Rose on reel. Jesse James is on reel 3 with Belle Star on reel 4. On reel 5, you will see Billy the Kid who appeared in the original Dead or Alive video slot. Anyway, 5 in combination will give you 166.66 times your total bet. Old Saloon Free Spins feature – boosting your winning chances during this round is a 2x multiplier which doubles all your wins. More importantly, all wilds are sticky and lock in position for the rest of the feature when they hit. A sticky wild on all 5 reels awards 5 extra free spins. Train Heist Free Spins feature – wilds are central to the action in this feature. They’re not sticky but each one increases a multiplier by 1x and adds another free spin to your total. If the multiplier reaches the 16x mark, an extra 5 free spins are awarded. There are no limits to how many free spins can be won and how high the multiplier can reach. High Noon Saloon Free Spins feature – sticky wilds are in play in this round too. Hope to see 2 or 3 wilds on the same reel as they combine to create double or treble multiplier wilds. For example, a 2x and 3x multiplier combine to deliver a 6x boost. Sticky wilds on all 5 reels once again add 5 more free spins. This feature uses NetEnt’s MAX concept found in other games (like Berryburst MAX) so it’s highly volatile – you can combine the multipliers to reach 27x which can result in a payout of 40,500 times your bet on each free spin! There is a cap of 111,111.11 times your bet throughout the feature. The original Dead or Alive was launched in 2009 so it’s about time we saw the sequel. NetEnt has done a pretty good job with it too. It’s as well designed as you’d expect and the wild and multiplier extras in the feature offer plenty of potential. As high variance as they come, fans of the first outing should find plenty to like in Dead or Alive II.